This NASA/ESA Hubble Space Telescope image shows star clusters encircling a galaxy, like bees buzzing around a hive. 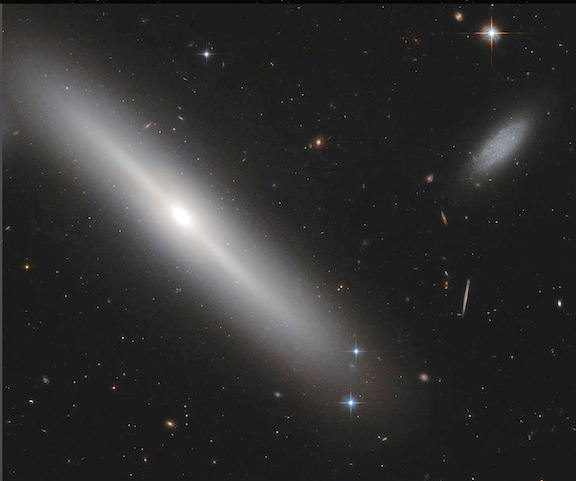 The hive in question is an edge-on lenticular galaxy NGC 5308, located just under 100 million light-years away in the constellation of Ursa Major (The Great Bear). Members of a galaxy type that lies somewhere between an elliptical and a spiral galaxy, lenticular galaxies such as NGC 5308 are disk galaxies that have used up, or lost, the majority of their gas and dust. As a result, they experience very little ongoing star formation and consist mainly of old and aging stars. On October 9, 1996, scientists saw one of NGC 5308’s aging stars meet dramatic demise, exploding as a spectacular Type la supernova. The dim, irregular galaxy to the right of NGC 5308 is known as SDSS J134646.18+605911.9.